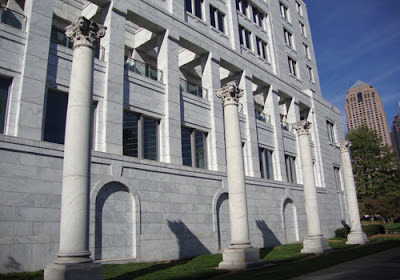 When the Federal Reserve Bank of Atlanta was built, there was no other building quite like it in the city and it remains a unique structure, especially among those that line Peachtree Street. Last month, I toured the Visitors Center and museum located on the first floor...and it was quite an impressive tour. In the background of this photograph is the 53-story GLG Grand/Four Seasons Hotel, a mixed-used (residence, office and hotel) skyscraper completed in 1992 located in the heart of Midtown. The GLG Grand is named for its Swedish developer, G. Lars Gullstedt.